The Market Development (MADE) programme is funded by UK aid from the UK government to improve how agricultural markets function in Northern Ghana. MADE uses a market systems development approach, partnering with the private sector, to address gaps in the market which prevent small holder farmers (SHFs) and rural enterprises from being productive. Northern Ghana is dry, with temperatures rising to 40°C. Climate change makes rain patterns and fall unpredictable and variable. For the majority of SHFs who are completely dependent on rain water for crop cultivation, producing good quality crops is challenging. On top of this, 50% of Ghanaians living in extreme poverty are based in the North. Five years ago, when the MADE programme began, the agricultural markets were not conducive to SHFs or the rural enterprises that sold goods and services to them. Farmers were unable to buy essential inputs for their farms, such as good quality seeds, or services such as tractors for field preparation as these products and services were either unavailable or unaffordable. Small and medium sized rural enterprises had limited knowledge of their SHF clients’ needs and of business models to expand their operations and increase sales. In addition, they were unable to access credit or any business support services such as accountancy or management consultancy, to strengthen or grow their business operations. Owing to the scale of the challenge, the MADE programme started small working in 4 value chains (rice, groundnut, onions and vegetables) and partnered with 4 enterprises to build support and momentum to make improvements to the market. The MADE programme assists enterprise growth by supporting the enterprises technically and financially; the partnering enterprises commit to the MADE partnership and also provide at least 50% of their finance to adopt and implement the MADE designed innovative business models. It took time to see improvements and results in how the agricultural market operate in Northern Ghana but by the end of the second year, the 4 partners had delivered goods and services to 9,757 SHFs (including 2,800 women farmers). These SHFs purchased locally, many for the first time, products, such as good quality seed and fertilizer, and accessed services such as land preparation by tractors and marketing of their products. Fast forward 2 years and at the end of the 2017 growing season, MADE’s 68 partners provided goods and services to 53,495 SHFs, 43% were women farmers. Over the last 2 years, the MADE programme has tested a number of new models, with rice and groundnut aggregators and onion and vegetable input dealers, having a positive effect on their bottom line and that of their SHFs. With the aggregators, MADE helped them to deliver a “bundle” of goods and services to SHFs such as machinery services, agricultural training and advice such as information on marketing and sales techniques etc. For SHFs, being able to receive the “bundled” goods and services on their farm reduces the time they need to spend away from cultivating their crops. For aggregators the “bundled” model decreases their costs of purchasing inputs and services from wholesalers. For both SHFs and aggregators loyalty and trust has been built. Aggregators are now more likely to offer SHFs goods and services on credit and SHFs are morel likely to repay this credit fully in the form of crops. Without credit, SHFs would be unable to purchase the goods and services, particularly in the planting period, when they have little cash left from the previous harvest. For input dealers, the MADE programme has helped them to increase the volume and variety of products they stock and sell by brokering relationships with major suppliers. The MADE programme has also helped with their sales and marketing strategies, such as the recruitment of 440 sales agents to visit SHFs in the most remote communities in Northern Ghana. And for the first time, input dealers provide after sales services to SHFs to ensure the SHFs get the very most from the inputs. The after sales services have expanded their client base and continue to build customer loyalty. As a result of MADE partners operating these models, agricultural markets are functioning more effectively. Proof of this is seen in the 48,164 (21,059 women) SHFs and rural enterprises with higher sales and turnover and the 48,220 (21,073 women) with higher income after the 2017/18 harvest. Incomes for each of the SHFs working with MADE partners has risen, on average, by £434 since 2015. A stand out success of MADE is the number of women farmers receiving goods and services from MADE partners and their improved crops and yields, despite less access to land, machinery and inputs and limitations imposed by cultural and social rules. In 2017, Women SHFs yield increase of 23.1% was higher than that of men at 14.8%. Women are proving good clients for MADE’s partners, adopting new agricultural techniques and being more credit worthy than many men SHFs. In its final 2 years, the programme will build sustainability through market improvements by transforming a cohort of strong rural enterprises into companies that catalyse growth in the markets. The programme is sharing evidence of its results with Government and donors to promote adoption of its models. By the end of the MADE programme, there will be better functioning agricultural market that enables small holder farmers and rural enterprises in Northern Ghana to be both competitive and profitable. 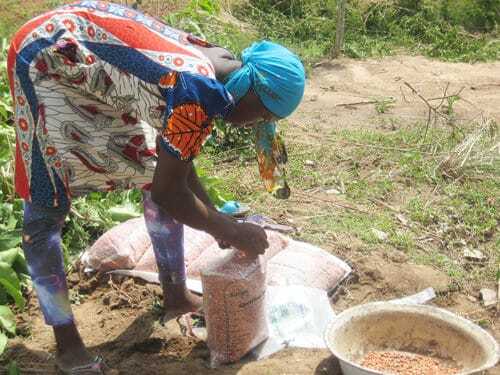 Ghana MADE is helping increase the income of women groundnut farmers!